The woods around Los Alamos are on fire again — but they’re supposed to be that way. 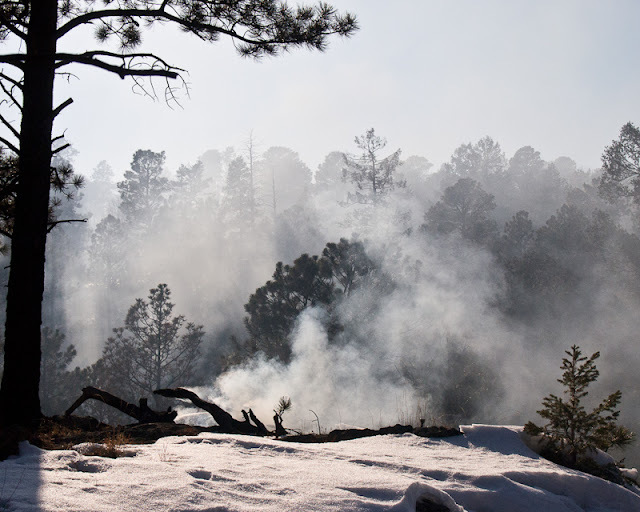 Apparently the Los Alamos wildfire plan (big PDF) calls for continual maintenance of the local forests by several methods, including fire. I think this is super cool; my intuition would be that the community simply wouldn’t tolerate fire in the woods near town. In this case, what’s happening is that over the past months or years, crews have gathered excess wood and other fuel from the forest floor into piles, and now that there’s snow on the ground, they are burning the piles. The above photo was taken yesterday afternoon, when over 100 fires were burning in Walnut Canyon. The county has a pretty good website explaining the details.